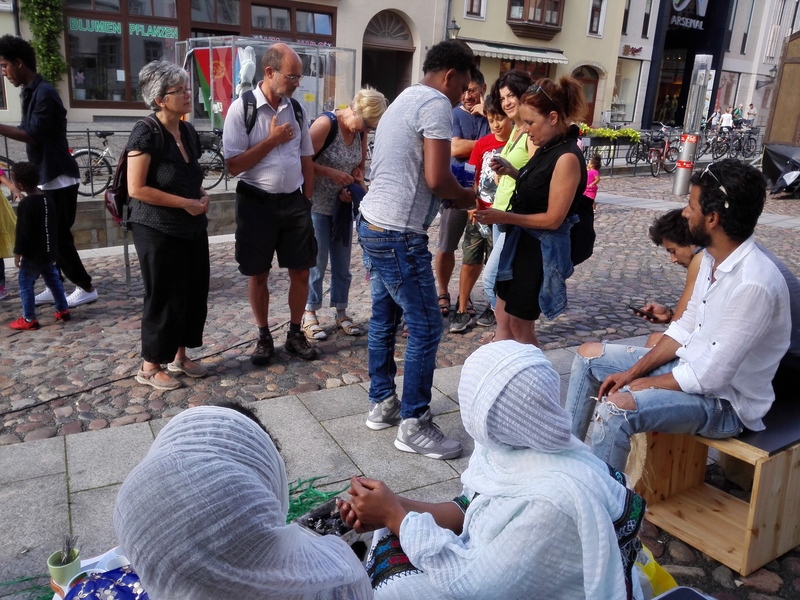 Wittenberg, where are your refugees? 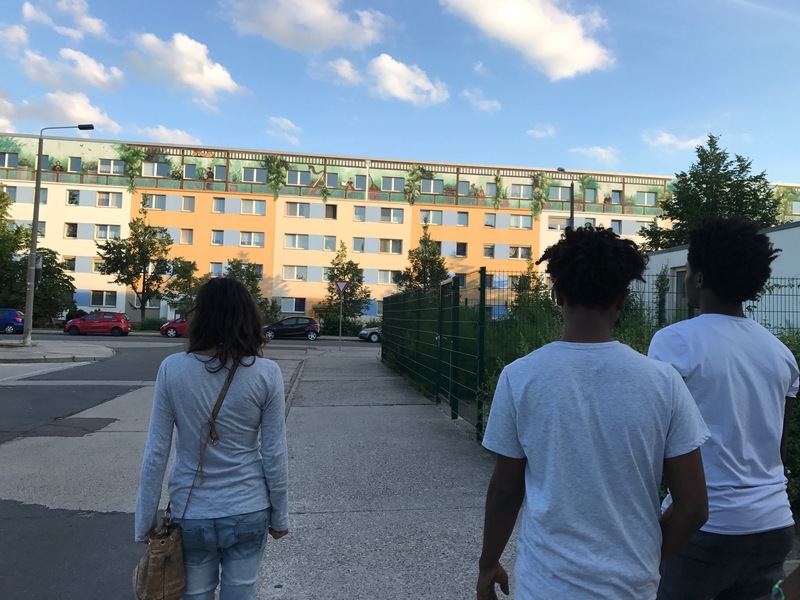 Searching for Eritrean asylum-seekers in Wittenberg feels somewhat like playing in a detective movie. Following uncertain traces of half-true information provided by residents living in the town, aimlessly cruising around in the outskirts of Wittenberg and finally getting one step closer to the the vision. The second we meet Mohammed on a lonely park bench, the deal is sealed. Almost. 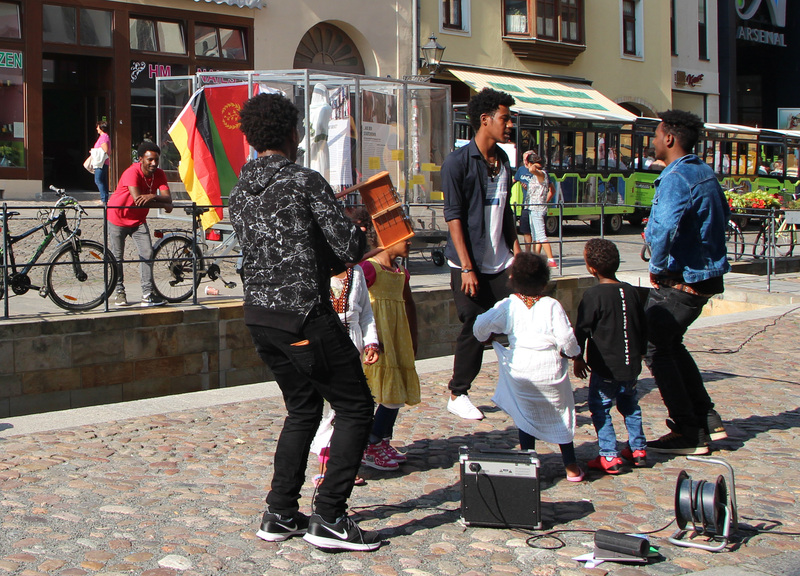 One week later, the event turns out in a cheerful Eritrean party with coffee, dancing and live music on the Krar, a five- or six-stringed bowl-shaped lyre from Eritrea and Ethiopia. 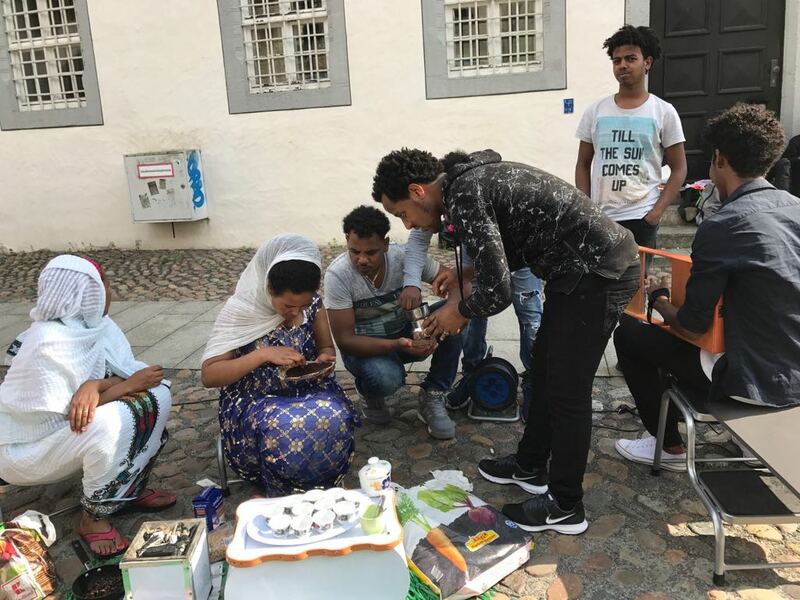 The initial idea of GLASPALÄSTE was to invite members from the Eritrean community in Wittenberg to organize their traditional coffee ceremony in the town center, for Eritreans as well as the people of Wittenberg alike. 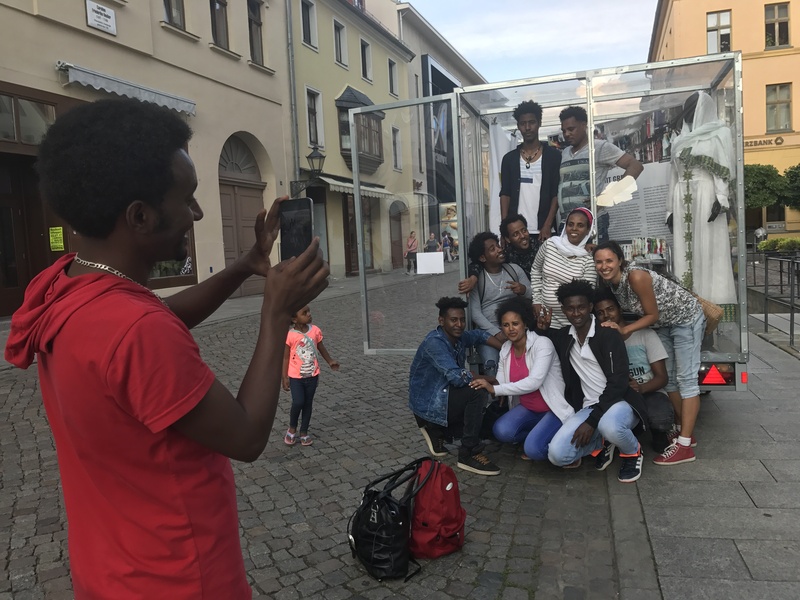 Opposite to the reality of ‚BLANKED OUT‘ in Neve Shaanan, the backyard of globalization, the asylum seekers were given a platform to make themselves visible and participate in the urban space of Wittenberg by displaying their culture. 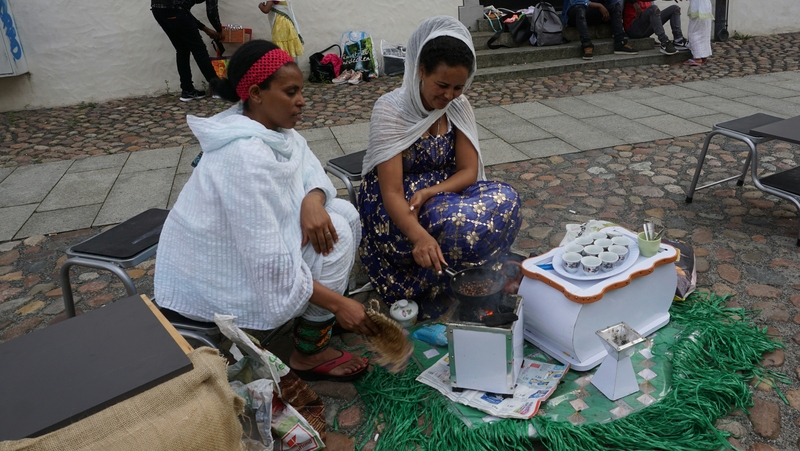 The coffee ceremony is an essential part in Eritrean culture that can only be performed by women. The coffee is brewed by first roasting the green coffee beans over hot coals. This is followed by the grinding of the beans. The coffee grounds are then put into a special vessel, called a jebena and boiled. A jebena is usually made of clay. When the coffee boils up through the neck it is poured in and out of another container to cool it and then is put back into the jebena until it happens again. 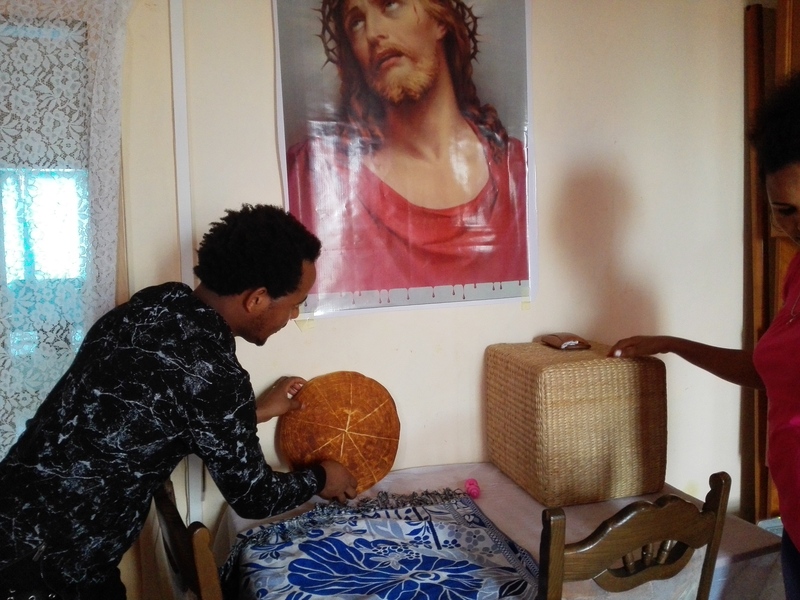 The hosts pour the coffee for all participants by moving the tilted jebena over a tray with small, handleless cups (finjal) without stop until each cup is full. The grounds are brewed three times. An excellent side dish for the coffee is freshly baked bread. The arrival of people seeking asylum is a global phenomenon that displays itself locally. 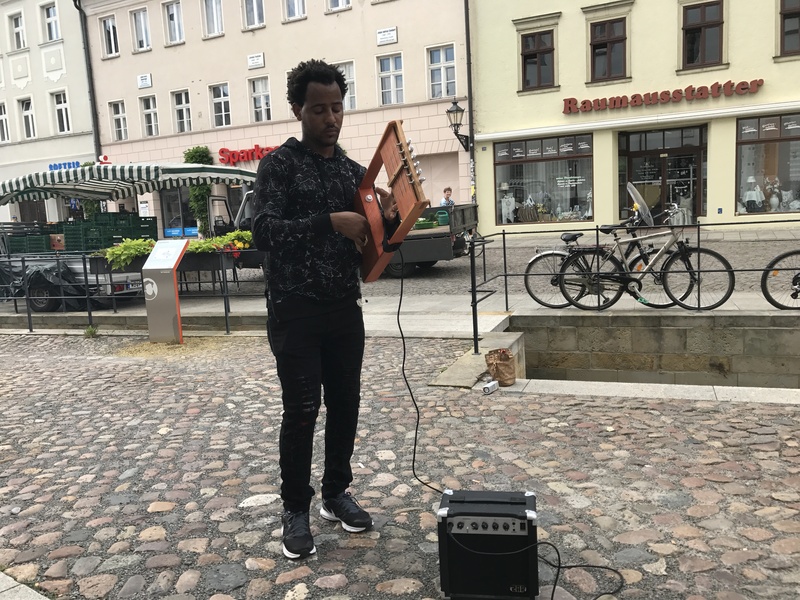 And while the differences between Tel Aviv and the Wittenberg could not be greater, the cultural elements brought into those two places by their Eritrean communities are surprisingly similar. For one afternoon, the Tel Aviv_PALACE was turned into a symbol for this transnational connection. 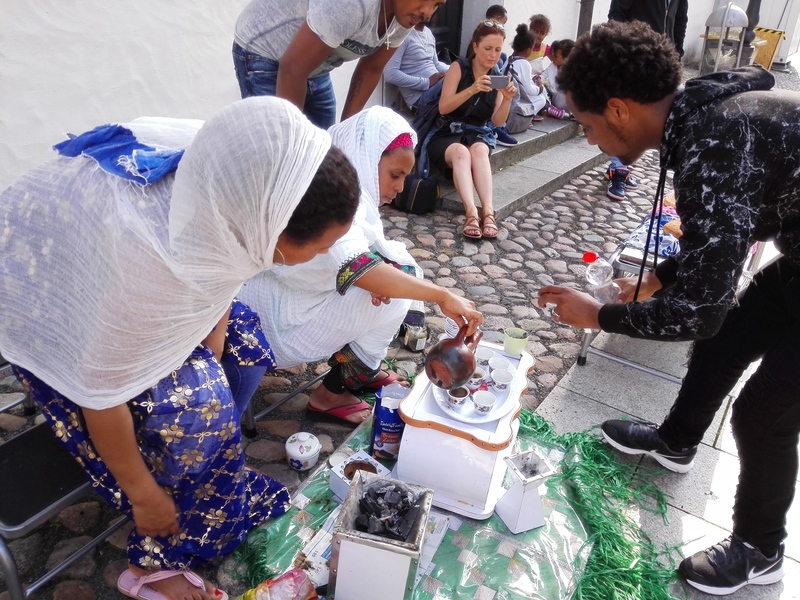 Positioned next to the location of the coffee ceremony, its presence in the urban space created a triangle between Tel Aviv, Eritrean culture and Wittenberg. 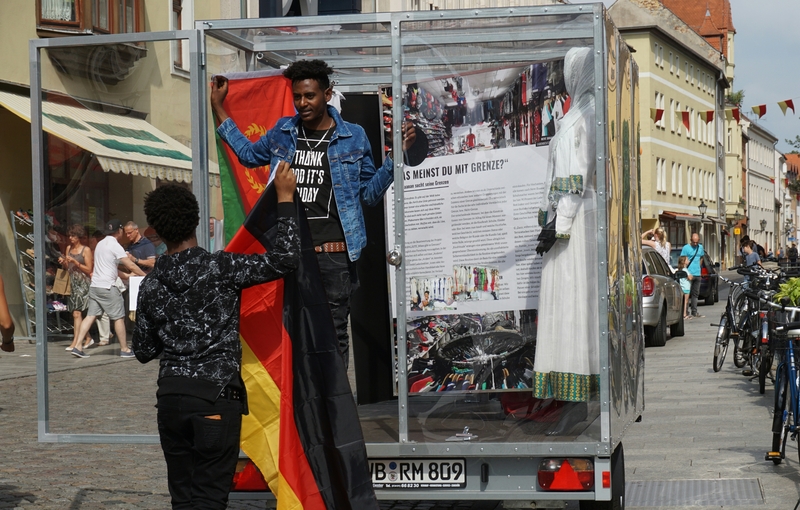 To underline their sense of new belonging, some members of the Eritrean community hung up two flags inside the GLASPALAST: One Eritraen and one German.